During the Medieval Age and the Renaissance, the “pittura d’infamia” (painting of infamy) was spread in Italian towns. What was this kind of painting? It was the ancient version of the wanted posters. Several centuries before the invention of photography, people - who ran away from a town - were convicted to the shame of being portrayed on the walls of the most important public palaces. Everybody passing could recognize men precisely depicted and potentially executed! In Florence, authorities often used the Palazzo del Podestà (the Bargello) walls and payed important painters as Sandro Botticelli, Andrea del Sarto and Andrea del Castagno, who painted the town traitors. The treason was one of the most serious crimes: convicts were painted hanged by a heel, with the free leg dangling. In 1440, after the Battle of Anghiari, Andrea del Castagno was commissioned to paint the members of Albizi and Peruzzi families. Because of this work he earned the nickname “Andreino degli impiccati” (Little Andrew of the hanged men), that he never could blot out. Leonardo never had this kind of commissions, but one of his drawings depicts Bernardo Baroncelli, one of the Florentine who took part in the Pazzi conspiracy, hanged from the windows of the Bargello palace, while the fugitive conspirators were portrayed by Sandro Botticelli on the walls of other important palaces. Some great Renaissance artists were commissioned to do these works because the authorities wanted good and recognizable portraits. However, artists did not like these commissions. Their work was similar to the executioner’s one, because they potentially killed people, and they could have been the target of a revenge. For these reasons – and because he did not want to be a new “Andreino degli Impiccati” – another artist of the Uffizi, Andrea del Sarto, accepted the commission, but he told that Bernardo del Buga – a painter of his workshop – made the portraits. They covered the wall where he was working with a big curtain: Andrea worked there at night, hidden by the curtain, so nobody could see him! We can admire some of his preparatory drawings at the Department of Prints and Drawings. Today we have no one of these works, because they were made on buildings walls and they were useful just for a short time. 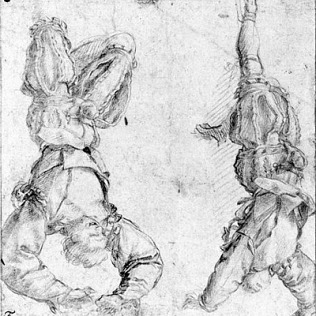 However we have some drawings: we remember these paintings to understand the importance – even in the far centuries of the great Florence – of media and public image!